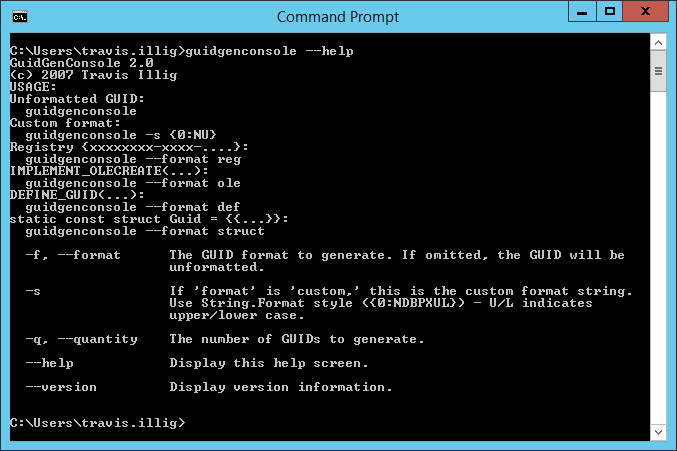 For those who haven’t jumped neck deep in PowerShell, it’s a pain to generate GUIDs. That GuidGen app that comes with Visual Studio is a pain. Everyone’s chipped in their own three-line GUID command-line generator, but I wrote one that fits my needs, so I figured I’d post it. How’s it different? Mine emulates the formatting for all of the available formats in standard GuidGen (though, admittedly, I don’t use the C++ formats like IMPLEMENT_OLECREATE so someone will have to tell me if what I’m doing is messed up) and it lets you create multiple GUIDs at once. The entire output gets copied to the clipboard, too, so if you just generated 15 GUIDs and you need to paste them into a file, you don’t have to copy each individually or generate 15 separate GUIDs. I didn’t bother even including a readme or anything with this because it’s dead simple. UPDATE: Based on comments from readers and trying a few suggestions out, I ended up going with ClipX, a free product that does exactly what I’m looking for. Office comes with a clipboard manager but it only works when an Office program is running and, frankly, it’s not my favorite. I can’t put my finger on why - all I know is I see that thing and I’m instantly confused. Maybe I’m just uninitiated. For the record, there is one feature missing from every single clipboard manager I’ve tried: I want to be able to select an item from the list and automatically have that replace whatever is currently on the clipboard. Every single one of these keeps track of what you put on the clipboard, but if you want to put one of the saved clips into your application, you have to double-click it and let the application do the “paste” action for you. I don’t want that. I want to be able to select the clip, then go back to whatever application and hit Ctrl-V myself. Trying to make sure the app the clipboard manager is going to do the paste in is the correct app is cumbersome and almost more trouble than it’s worth. If someone knows of a [preferably free] clipboard manager that allows you to select an item and have it become active on the clipboard, let me know. If it’s good enough, I’d even consider paying for it. That’s how much I want that feature. Oh, and several clipboard managers I came across use databases to store their stuff. No thanks. I don’t need another service running just to help manage my clipboard. I want this thing to be lightweight and self-contained. LW-Works Clipboard Recorder: This is the one I’m currently using. There are two “views” for it - this little floating window (pictured) and a larger window that allows you to select one of the clips and preview it. It has support to preview several data types on the clipboard and is fairly configurable. You can set it up to show with a Windows hotkey, you can specify what sorts of things you want to be able to keep on the clipboard list, you can allow (or not) duplicate clippings from the same application… it’s pretty good. I like the detail with this one - two views, the primary view being a super-compact window that conserves space but isn’t so small it’s unusable; the fact it puts the icon of the application it grabbed the clip from right next to the clip; the fact it minimizes instead of closes if I hit the “X” button in the corner of the main window. If it had the selected-item-in-list-is-active-on-clipboard feature, this would be The One. There is a free version and a professional version. The free version has anything you need for a general clipboard manager. The professional version adds the ability to have multiple clipboard lists, save lists for later retrieval, send clipboard items to another computer, and paste multiple items at the same time to an application. Clipboard.NET: This is an open source project that is fairly young but is shaping up to have some nice features. The notion of having a plug-in framework for the clipboard monitor is appealing to me, and this has that. Several of the features (“Paste As HTML,” “Google This,” etc.) are implemented as plugins, and that’s cool. The UI could use a little help as it is fairly large to have running all the time and has a lot of wasted space. There are a lot of options that could be added as well. Unfortunately, I spoke to the author and he doesn’t have much time to dedicate to this lately, so unless someone else steps up, we may not see this come to fruition. Ditto: This is a pretty popular open source project that has a lot of features. Too many features, in fact. So many, I almost can’t even tell you what the thing can do. I mean… well, let me show you, rather than tell you: Notice how there are six tabs’ worth of options? Each tab has the bajillion options on it that you see here. The working of the application is about this complex. Maybe it’s just me - I bet this thing would do all I need it to if I could only wade through all the options and figure out how to get it to work. It feels like this started out cool but ended up with huge feature-creep. Definitely by programmers for programmers. My mom would never be able to figure this out. And, honestly, I’m not eager to personally take something like this on. So there you have it. I haven’t yet found “the perfect clipboard manager.” Like I said above, though - if someone has one that they think can satisfy me, I’d love to hear about it. Leave me a comment with a link so I can try it out. The key feature - in fact, it might have the worst UI ever but this feature would make it worth it - is to select an item and have that become the active clipboard item. None of these do that. Saturday Jenn and I went with my friend Torin to check out Night at the Museum. It was actually pretty darn good in a “cute” sort of way. I don’t know that I’ll be buying it on DVD, but I didn’t walk out feeling like I was cheated out of my money, either. Tuesday and Wednesday some serious cold weather hit the Portland area and made the roads really icy, so Jenn called in sick and I worked from home. You can see some of the footage of people who decided to drive in it. Not good. My dad had some trouble sliding around, too, and is going to have to make a visit to the local body shop to get his car fixed up. I don’t ever really feel productive when I’m home, though, because frankly there are so many more interesting things to do than work. But you gotta do what you gotta do, and I ended up on the couch with a TV tray and my laptop. Not terribly ergonomic by any means. I’d have blogged all this yesterday, but we saw a huge spam increase at work and in order to stem the tide, hosts that sent spam to us were being blocked for access. Unfortunately, someone must have sent spam spoofing my domain or something because somehow my site got flagged as a spam site and I couldn’t connect. I’ve got the block removed, but now I’m working with my ISP and our IT guys to see why I got blocked in the first place and track down what we can do to stop it in the future (if anything). I’m in a shared environment, so there’s not a lot I can do from a server lockdown perspective other than having strong passwords on my accounts. I’m just not interested in what I’m tasked to do, so it’s difficult to have a lot of zeal. Hopefully there will be something more fun to deal with next week.